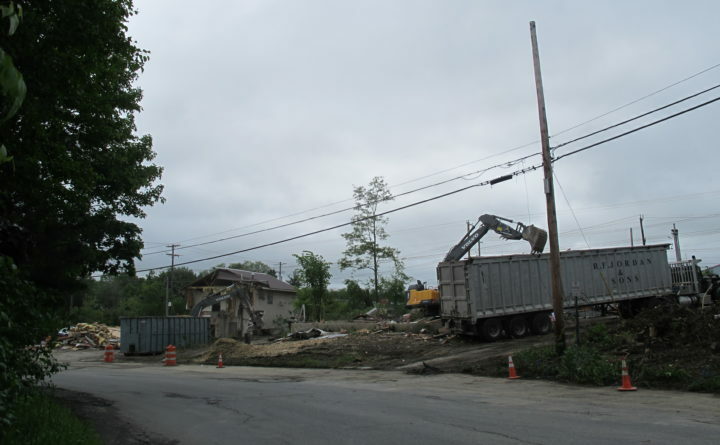 Rubble is all that remains of the buildings located at 12 Alden St. and 543 Broadway in Bangor. The Alden Street building was the former home of Momma Baldacci's restaurant. Backhoes tore into the building that formerly housed Momma Baldacci’s, an iconic Bangor restaurant that closed 10 years ago, on Thursday morning. The building, located at 12 Alden St., just off Broadway near the I-95 interchange, was torn down alongside an adjacent building located at 543 Broadway. Both are owned by Bangor Broadway LLC, a subsidiary of Coffman Development Group, a Massachusetts-based real estate firm. According to its website, ConvenientMD, a for-profit urgent care and walk-in care clinic, will be building a location at the 543 Broadway site in the coming months. ConvenientMD is a New Hampshire-based business providing general urgent and walk-in care for non-life threatening illness and injuries, such as viral illnesses, minor cuts and sprains and other issues. ConvenientMD has rapidly expanded in the past year, with new locations in Portland and Westbrook last year, and more locations coming later this year in Newburyport, Quincy and Weymouth, Massachusetts. Attempts to reach ConvenientMD’s corporate office in Portsmouth, New Hampshire were not successful Thursday, though Bangor’s community and economic development director Tanya Emery confirmed that the business will begin construction this summer. The Baldacci family may today be better known for its political figures, including former Maine governor John Baldacci and former Bangor city councilor and mayor Joe Baldacci, but for most of the 20th century, they were known as restaurateurs. The Baldacci family opened their first restaurant, the Baltimore Restaurant, in 1933 underneath the Joshua Chamberlain Bridge in downtown Bangor. The restaurant moved to a few other Bangor locations before the family purchased the building at 12 Alden St., where they opened Momma Baldacci’s in 1975. The restaurant served up classic Italian American dishes for the next 33 years, and became a favorite spot for photo ops for politicians passing through town, including Hillary Clinton, Jerry Brown, Paul Tsongas and Ted Kennedy. Momma Baldacci’s closed in August 2008, after the family sold the building to Greg Lovley, a Newport-based real estate developer. It’s not known when Coffman Development Group purchased the building and the adjacent building at 543 Broadway.